A low vision CCTV is an electronic magnifier that can magnify your reading, pictures, etc. at a much higher power than a regular magnifier. It can be one of the most helpful vision aids for those with advanced macular degeneration. This low vision technology makes it possible to read with a large viewing area and higher magnification than a typical handheld magnifier. 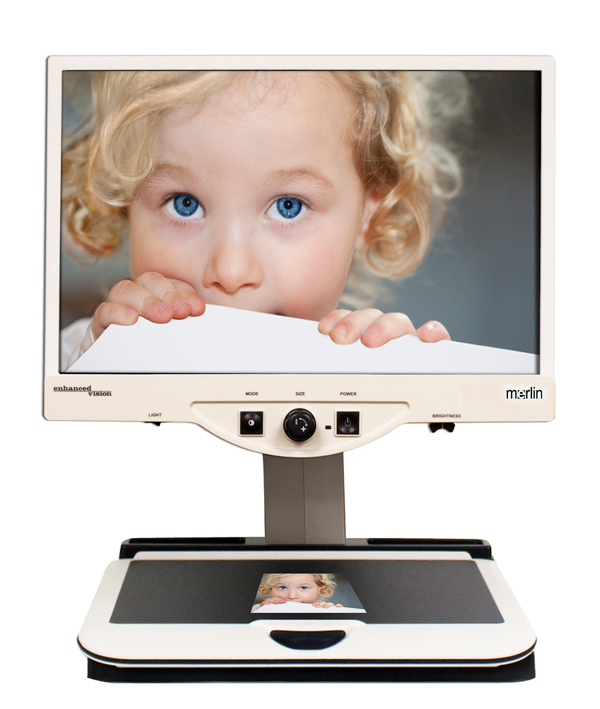 Sometimes called a desktop magnifier, this technology provides a large viewing area with up to a 24" LCD screen and magnification up to 73X. CCTV stands for closed circuit television. The special camera focuses on what you want to see (i.e. a pill bottle, a check, a photograph, newspaper, etc,) and displays it on a large screen. The camera also incorporates a zoom lens which allows the level of magnification to be adjusted. 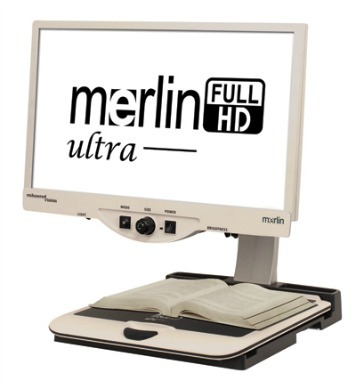 Electronic magnifiers provide several benefits over traditional glass magnifiers. The cost of these magnifiers can range from $200 to over $3000 and are well worth it for those who are unable to read without one. Before making a large purchase consider meeting with a low vision rehab specialist. They can assess your needs and then make recommendations for the best magnifiers for you. They can also provide training in the use of low vision technology. When purchasing a video magnifier, use your best judgement and select one that offers a free trial period so that you can try it at home and see how it works for you. A low vision closed circuit television (CCTV) is for people who need text and photos magnified, but find that their current optical magnifiers are no longer meeting their needs. When selecting a video magnifier, you should first test it yourself with items such as a telephone book or a utility bill, a checkbook, newspaper or a photo. It is very easy to operate and you may find it to be an invaluable aid for magnifying and seeing just about any object and/or reading material. The CCTV monitor can magnify not only reading material but objects as well, like a prescription bottle or label on a jar. Do I Need a Low Vision CCTV? 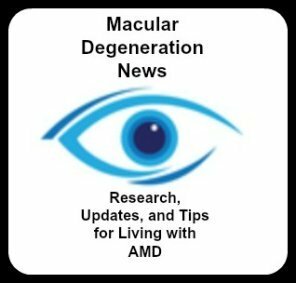 According to Dr. Lylas Mogk, author of Macular Degeneration: The Complete Guide to Saving and Maximizing Your Sight "a CCTV is an excellent tool for anyone with less than 20/70 vision. If you have less than 20/400 vision you should definitely consider purchasing one." Ask your low vision specialist which brand or make they like and what features their favorite one has to offer. Your low vision specialist can assist in helping you select the make that is best for you and then teach you how to use it. 1. Will CCTV (closed circuit television) technology be helpful for me? 2. Which system do you recommend? 3. How will the system be used and for what purposes? 4. What features does it offer? 5. How large is the monitor? Does it offer a color screen or just black and white? If you decide to purchase one yourself on line be sure to ask about the return policy. Find out how much shipping costs and if you have to pay shipping to return it. The best way to find out if this device will work for you is to have a free in-home demonstration. A representative from Enhanced Vision will bring right to your house several of the different electronic magnifiers so you can try them first. There is no obligation and no pressure to make a purchase. In the comfort of your own home you can try reading recipes or books or try performing tasks or hobbies with the increased magnification from a desktop magnifier. Use it for 30 days and then decide if you want to keep it or not.